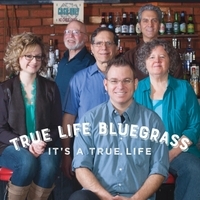 Our music is steeped in the traditions of bluegrass, though we wander outside those traditions when we find newer songs that express the real experiences of ordinary people (as we call them, songs of true life). After a mere 32 years of playing together, one of the most venerable bluegrass bands in the Boston area has released our first CD. We've selected 15 of the songs that best represent our band in terms of vocal and instrumental variety; it's music that we think, in the words of one of those songs, "makes the world a better place". Mike Reese (of Chasing Blue) recorded and mixed the record. We are very excited and pleased to have the chance to capture the sound of the band performing some of our favorite songs from the past three decades, and are delighted to share it with everybody!